The authors have created, in their words, a “near-species-level” phylogenetic tree of approximately 832 species using genes from both mitochondrial (all species) and nuclear (all genera) DNA, a major computational feat that produced a tree so large that its figure is split into six parts in the paper. 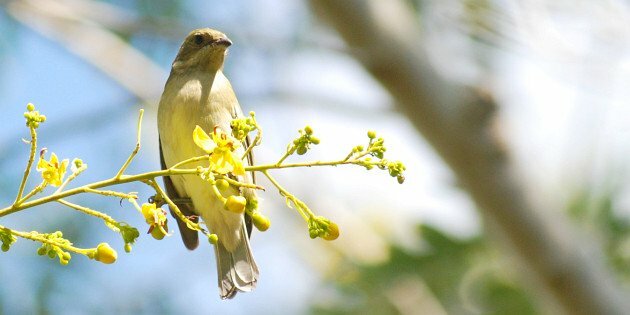 The tree is broadly consistent with work published by the same authors last year, which identified 16 different families in the group, recognizing families for the Old World buntings (Emberizidae), New World sparrows (Passerellidae), wood-warblers (Parulidae), blackbirds (Icteridae), longspurs (Calcariidae), cardinals (Cardinalidae), and tanagers (Thraupidae), as well as several very small families for historically problematic species like the Yellow-breasted Chat and Caribbean spindalises. Importantly, the paper offers support for the hypothesis that the ancestor of the entire clade came to North America by way of Beringia — the land bridge between Siberia and Alaska exposed at various times through Earth’s history. The authors argue that most major groups, including the sparrows, wood-warblers, blackbirds, and cardinals then diversified in North America and subsequently colonized South America in a series of overwater (before the Isthmus of Panama had formed) or overland dispersal events. 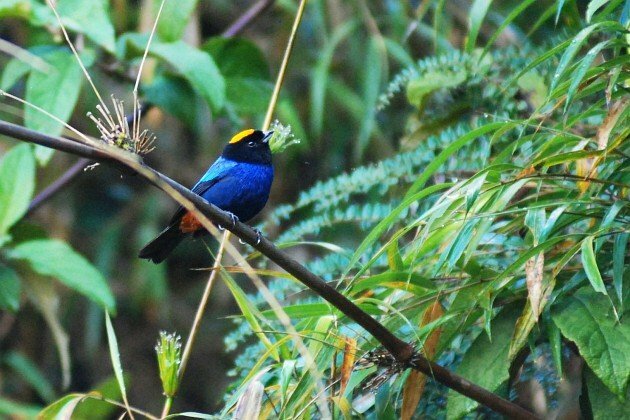 An early pioneer, however, made it to South America early on and founded the tanager lineage, which has gone on to diversify into nearly 400 species. The distribution of Old World buntings (and the presence of longspurs and Snow Buntings in the Palearctic) is explained by colonization back across Beringia into Asia. It also appears that at least one early radiation from North America into the Caribbean resulted in several relatively old island lineages, which the authors treat as four families, Nesospingidae, Spindalidae, Calyptophilidae, and Phaenicophilidae. They acknowledge that the confident positioning of these and other historically problematic taxa will require broader genetic sampling, however. If these four groups are in fact shown to form a monophyletic clade, one option would be to treat them as one family, instead of four, as Don Roberson shows. This very large, very resourceful group of birds is starting to give up its secrets. We now know a lot more about who is a tanager vs. a sparrow vs. a cardinal. The wood-warblers are coming into focus, and the sparrows are getting their own family. We know that these birds disperse over land and over water (the Galápagos finches are specialized tanagers), but we still don’t know how their long-distance migratory strategies arose or how to classify some of the old and sedentary lineages. And now we know even more about where these birds came from and how they spread through the Americas, adapting rapidly and in some truly spectacular ways to the threats and opportunities they encountered — a feat that continues today. The paper is by leading researchers F. Keith Barker, Kevin J. Burns, John Klicka, Scott M. Lanyon, and Irby J. Lovette, and it’s open access in The Auk: New insights into New World biogeography: An integrated view from the phylogeny of blackbirds, cardinals, sparrows, tanagers, warblers, and allies. Thanks for pointing out this article! We so often focuses on the mammals that crossed the Bering land bridge. It’s nice to see it expanded to other animals! The “near species” level tree is downright incredible. Question: Why are wood warblers still “Parulidae” if Parula is no longer a valid genus? 1. It looks like either Emberiza will soon include Melophus and Latoucheornis or it will have some splits. As a North American birder, I have no idea what these birds are. 2. Among the sparrows, we knew the American Tree Sparrow was going to be split from Spizella. Also, Ammodramus is going to be split two to four ways. 3. The Spindalises are not going to be tanagers much longer. They’re closer to warblers and Icterids, but it looks like they’ll get their own family (maybe with a few other former tanagers and warblers). 5. Yellow-breasted Chat is between the Icterids and warblers, but closer to the Icterids. 6. The Icterids had already been figured out. 7. Snow Buntings and Longspurs are more closely related to Cardinals and tanagers than to sparrows and Emberizid buntings. 8. The true tanagers (Thraupids) need some work. As a North American birder, I have no idea what any of these birds are. The International Code of Zoological Nomenclature states that the name of a family doesn’t have to change even if the genus on which it is based is merged into another genus. That’s why the wood-warbler family is still called Parulidae even though the species formerly placed in the genus Parula have all now been reassigned. And yes, there’s still a lot to be done at the family, genus, and in some cases species level to sort all this out. Thanks. I figured something like that, but I didn’t even know where to look and hoped that others would find any answers enlightening as well.